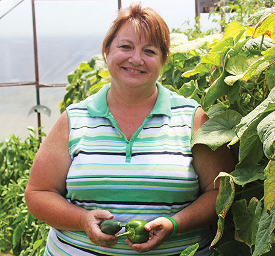 Brenda VanBoovan inherited a love of gardening from her Grandma Bader's farm. They always had lots of tomatoes, corn, green beans, and an abundance of fruit trees. This love of gardening lead to the construction of a 30-foot-long by 72-foot-high tunnel behind her home, where she grows cold crops and takes advantage of early seasonal vegetables. The High Tunnel has enabled Brenda to extend the growing season. She has a multitude of cold crops throughout the winter with tomatoes and peppers available by mid-June. Brenda typically sells her produce locally at the Hermann farmers market when items are in season. Brenda and her husband, Dave, both came from large farm families and currently raise cattle, and grow hay and corn near Rhineland in Montgomery County. Members of the Greater St Louis Daffodil Society are thrilled that Brenda has found time for a presentation where she will share her journey and knowledge gained for extending the growing season.